Well, yes some if it is true but you would be surprised how well those small and agile dogs can do in disaster and wilderness searches. They are highly motivated, fast, willing to learn and want to please. But it all depends on the personality of your dog. Shirley M. Hammond said that the ideal Disaster Search Dog must be very self-confident, energetic, and have a high hunt/prey/retrieve drive. The dog must be capable of independent work, be sociable, in good health, be structurally sound, and capable of ignoring the typical loud noises of a disaster site. You want to select a dog that will be agile and able to tolerate lots of physically demanding activity. 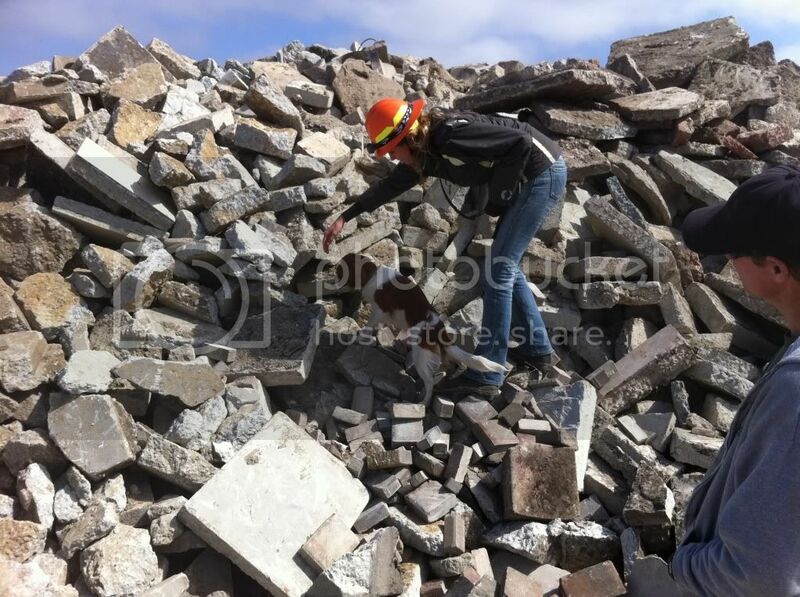 Disaster agility involves skills needed to negotiate various obstacles that the dog may encounter during a disaster incident-walking and climbing on concrete rubble, rebar, broken glass, hanging hazards, dust and other building materials. Puppy behavior or temperament evaluations can give very helpful information in choosing a potential search candidate since you can test for some of the selection criteria mentioned above. It will by no means give you an absolute guarantee that the dog will succeed. This previous paragraph is a brief intro to the disaster search dog. The Search and Rescue dog, also called the area search or wilderness search dog, is used to search a specific area by covering or gridding large geographic areas, while sampling the air currents for traces if human scent. Most SAR dogs work off-lead and will range far away from the handler while quartering back and forth through the area, searching for human scent that is carried in the air currents. The handler is assigned a search area and is responsible for covering the area, documenting the area covered, and reporting back to the search base when the assignment is complete. This dog will demonstrate a trained alert behavior that indicates to the handler that the dog has made a find. The SAR dog typically searches in a natural environment which may include some natural hazards, such as rushing rivers, wild animals, blackberry patches, and poison oak to mention a few. Some special agility training should be included in the overall SAR dog’s training program. The dog must be able to climb and move around logjams, fallen trees, and navigate across slopes with loose, slippery rocks or large boulders along the river. SAR dogs and DSDs differ in the type of training they receive and the environment in which they must search. There are other types of search dogs which I will not elude on further, for example the trailing dogs and human remain search dogs. In the US, both SAR and DSD training is very time consuming and very rarely are dogs certified and ready for mission in both types of searches. We participate in weekly trainings with Monterey Bay Search Dogs and Amica is now 7 years old and certified as a life-find/wilderness search dog (CALOES). She is participating in searches thoughout California and re-certified twice. We started training Amica when she was 10 weeks old. Different people in the field have different opinions. Some think that doing baseline obedience and scent training for the first year of life is better than exposing a puppy to rubble and wilderness. Others are convinced that the early exposure and training in that environment are helpful in shaping a well-rounded dog in order to prepare for missions. 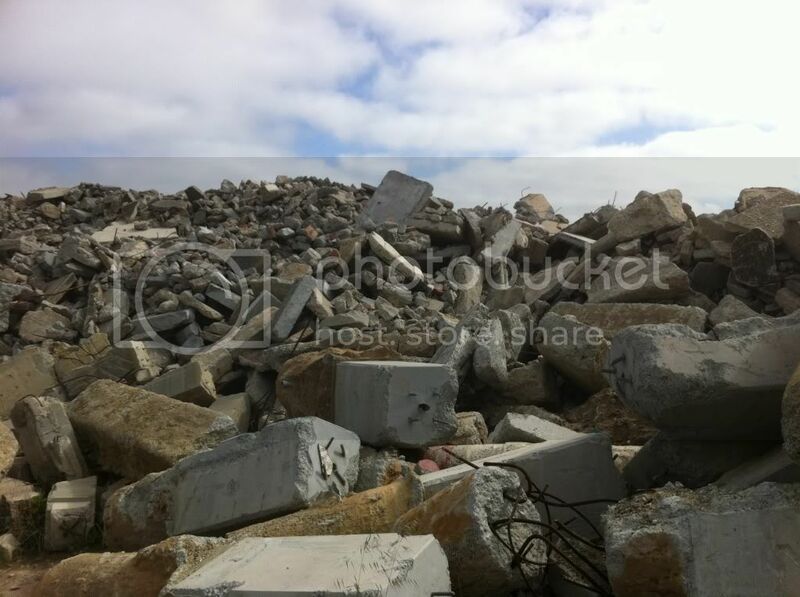 Rubble piles like this are used to train the dogs. The way of alerting in the disaster environment is a bark alert, in wilderness it is the Bringsel. Our recently deceased Kooiker Nelle was a retired Search and Rescue Dog and was trained in both disaster and wilderness back in Germany. Over there, bark alert is used for disaster and wilderness. Since the search areas here in the US can be bigger and more dense, a bark would not travel appropriately in the air to be heard. The dogs for wilderness searches in our group here are taught the bringsel alert. The bringsel is used as an indicator of the found object. The bringsel snaps on the dog’s collar and looks like a small leather bumper. When the dog has located the missing object or person, he grabs the bringsel into its mouth and returns to the handler. The dog is required to keep the Bringsel in the mouth until told to “give” by the handler. The handler un-clicks the Bringsel from the collar and tells the dog “show me”. The dog should track the similar path back to the victim followed by the handler. The training takes on average 2-3 years until both handler and dog complete certification and are mission-ready. There is not a formal assessment process for the suitability of the human part of the team. In order to become a disaster dog handler, people must be prepared to make a large time commitment to classes, training, meetings, and eventually, deployment. The handler needs to be able to pass certain courses and tests. Basic First Aid and Cardiac and Pulmonary Resuscitation (CPR) are at the top of the list, however it is useful to take the Red Cross Emergency Response Class or to look into becoming an Emergency Medical Technician (EMT). Rescue Systems I, Confined Space Awareness, and Hazmat Awareness, are important classes that can be obtained by team members through Fire Departments or the US&R system. Critical Incident Stress classes are very important for the mental health of team members. This is supposed to give you a glimpse of what our dogs are able to do-even the Kooikerhondje. I would like to explain the training and discipline of human remains detection (HRD) or Cadaver Dog training in more detail. It is the training we had started with Toni, the third Kooiker in the household. Some of you might wonder how that could possibly be interesting or fulfilling to train a dog to find parts or an entire deceased human body or bones that were buried a long time ago. Cases that call for a certified HRD dog are crime scenes, or when too much time has passed to find a missing person alive. There are many other areas for these dogs including archaeological or ancient remains detection. Example of projects that call for these highly specialized and trained dogs are the need to find burial sites in Indian reservations, victims of disasters like the mudslide in Western Washington, or historical cases. A group out here in California that has specialized in that area is called “CSST” (http://www.csst.org). HRD training starts with imprinting the dog like any other dog training. The dog gets rewarded when he sniffs/shows interest in human remains like blood, tissue, bone, teeth and such, depending what the training is aiming for. He is not allowed to lick, eat, avoid, urinate or defecate on or near the source. Clicker training is a great way to teach the dog these first steps. Usually smaller particles of source are used at the beginning. The scent can be easily overwhelming for the dog. How are these dogs alerting? There are many ways of doing so like body position, bringsel, jump on the handler and re-find by leading the handler to the source. We are currently training a “down” position with Toni. The dog needs to learn that the source is ideally between his paws. This narrows the area down a whole lot in case you want to find a drop of blood or a single tooth. However, in a test usually a distance of 3 feet to the source is accepted. Remember that the source is usually not visible for the dog and wind can carry scent around in many unexpected ways. Over time, training will introduce different sizes of sources and hidden in different types of places (hanging, buried, scattered, etc. ), distractions like animal remains, buildings, and noise distractions. For certification, an area of about one acre is searched. Nose time is about an hour. Remains should be placed at least 20-30 minutes before training in order for scent to distribute enough. The handler is required to take different courses in crime scene awareness, human remains decomposition, weather interpretation and others. There are many factors that can make a search for human remains easier but also harder. Toni loved this type of work. Human remains are officially donated to our groups by the sheriff’s departments, forensic medicine and through private donations. The sources are labeled and handled in a professional manner. I hope that this gives you an insight on an interesting canine type of search work. Kooikerhondjes are so versatile and smart. It allows to combine useful volunteering and spending time training our dogs. It is our wish that breeders not only pay attention to the health and beauty of their Kooikers but also aim for breeding Kooikers that have the drive to work and perform.